Today saw the close of another very successful Summer School in Oideas Gael. 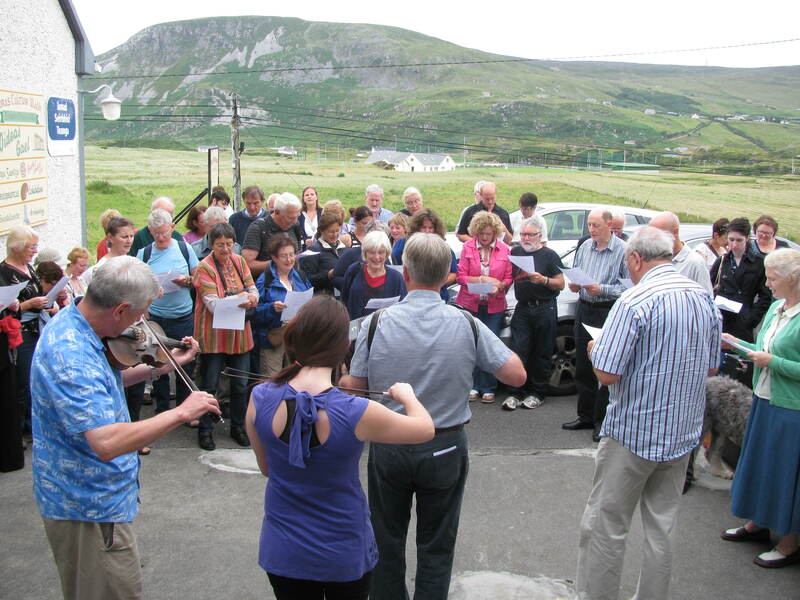 Over 120 participants from all over the world arrived in Gleann Cholm Cille last Saturday to enjoy a week of language learning that catered for various levels each morning and afternoon workshops in bodhrán with Paddy Mór, tin whistle with Liam O’Neill, set dancing with Colm & Seán Treanor, sean-nós singing with Gearoidín Bhreathnach, sean-nós dancing with Máire Áine Ní Iarnáin, drama with Ray Yeates, hillwalking with Tony Birtill and Italian cooking as Gaeilge with Salvatore! Every year the Scoil Samhraidh features a varied programme of evening activities. After our Gathering event on Sunday Seoirse Ó Dochartaigh entertained participants at the School. On Monday night Ray Yeates and friends staged their play, ‘Dara an Choctaw agus Hip Nós’. An Dr Nollaig Ó Muraíle of the National University of Ireland, Galway, gave the Tuesday night lecture “Tír Chonaill agus Inis Eoghain, nascanna leis an chuid eile den Eoraip sa 16ú agus 17ú aois”. On Wednesday night Tale of the Gael performed a midweek concert. Hosted by Gearoidín Bhreathnach, the Thursday night sean-nós concert was, as usual, a highlight and featured singers from the Donegal Gaeltacht including Lillis Ó Laoire. Friday night’s closing concert featured Máire Brennan, Ashley Davis & Cormac de Barra and was followed by the Céilí Mór. We had two book launches during the Summer School. Professor Joe Watson launched Críona Ní Gháirbhith’s Gaeilge an Chláir on Tuesday evening. The book, which is in Irish and English, is a collection of words and phrases in Irish that are used in the everyday conversational English of County Clare. On Thursday evening Éamonn Ó Dónaill launched Colm Ó Snodaigh‘s new book Istigh sa Cheol. Colm’s monthly articles for online magazine Beo.ie from 2006-2011 formed the basis for this collection of essays on music. Keep an eye on our Facebook and Flickr pages for photos from the week, coming soon! Oideas Gael Students at An Dúchas Lom beside Foras Cultúir Uladh, Gleann Cholm Cille. 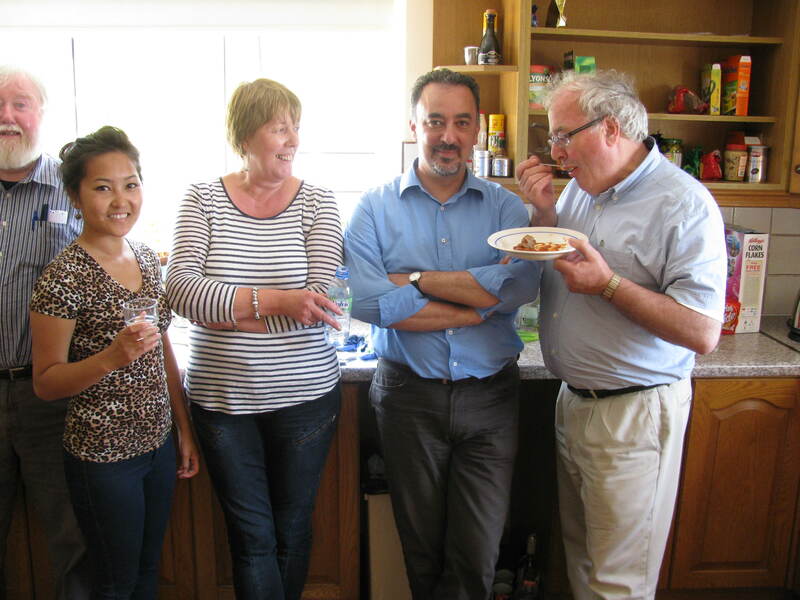 It being the year of The Gathering, Oideas Gael hosted a special ‘Tóstal’ event for participants in our Language and Culture Summer School; this was held in response to a personal invitation from Leo Varadkar, TD and Minister for Tourism, who attended an Oideas Gael language course last August. John Gleeson, UWM, and Professor Joe Watson read medieval Irish poems from Dhá Chéad de Cheoltaibh Uladh and Dr. Stiofán Ó Direáin read his own poem, ‘Aingeal an Ghleanna’. Bernardine Nic Giolla Phádraig sang Pádraig Ó hAolain’s ‘Cóilín Phádraig Shéamais’ (The Conamara Anthem), Maggie McGwin from Milwaukee sang ‘Báidín Fheidhlimidh’, Kerry Ann Maloney sang ‘Gleanntáin Ghlas Ghaoth Dobhair’ and Ashley Davis sang ‘Doire Cholm Cille’. Ray Mac Manáis composed a ‘Ray special’ for the event and we had music and singing from Catherine McGinley, Ellie McGinley & Aisling Ní Churraighín. The Gathering Ireland is a year-long celebration of Ireland, its people and all that is great about its connections, both at home and abroad. The Gathering Ireland invites anyone who has a link to Ireland or just a love of the country, to come to Ireland for a series of events throughout 2013. The Language and Culture Summer School is the highlight of the three summer months in the hectic Oideas Gael calendar. Language classes are offered at several levels from beginners to fluent speakers in the mornings and afternoon workshops are organised in Tin Whistle, Set Dancing, and Sean-nós dancing with Máire Áine Ní Iarnáin, Sean-nós singing with the legendary Gearóidín Breathnach, Hillwalking with Tony, Bodhrán with Paddy Mór, drama with Ray Yeates, and tasteful Italian cooking with Salvatore! Evening concerts, drama and lectures round-off each evenings scheduled activities with the unschedulued following on into the wee small hours. 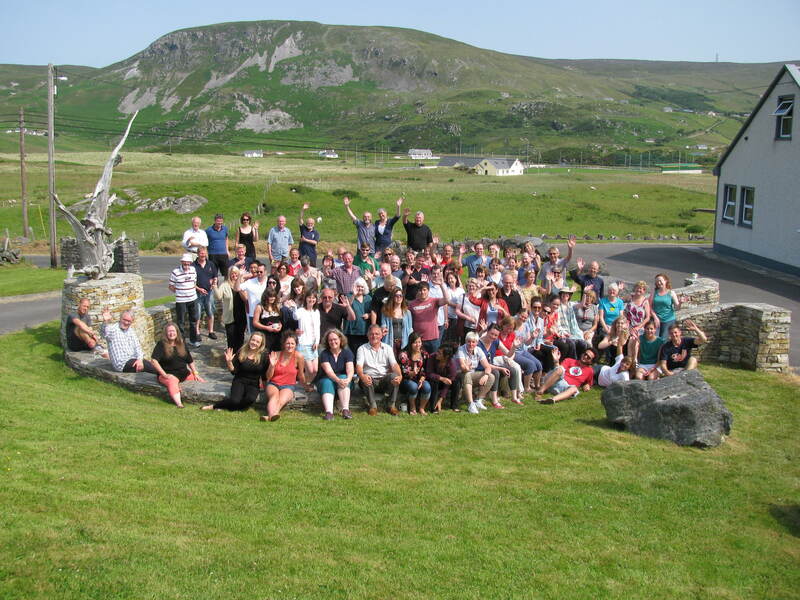 Those with an interest in Irish culture and a love for the Irish language, living both in Ireland and far afield, have been coming together in the Donegal Gaeltacht since Oideas Gael began in 1984 and we are delighted to mark The Gathering this year. View all the photographs from the evening here. 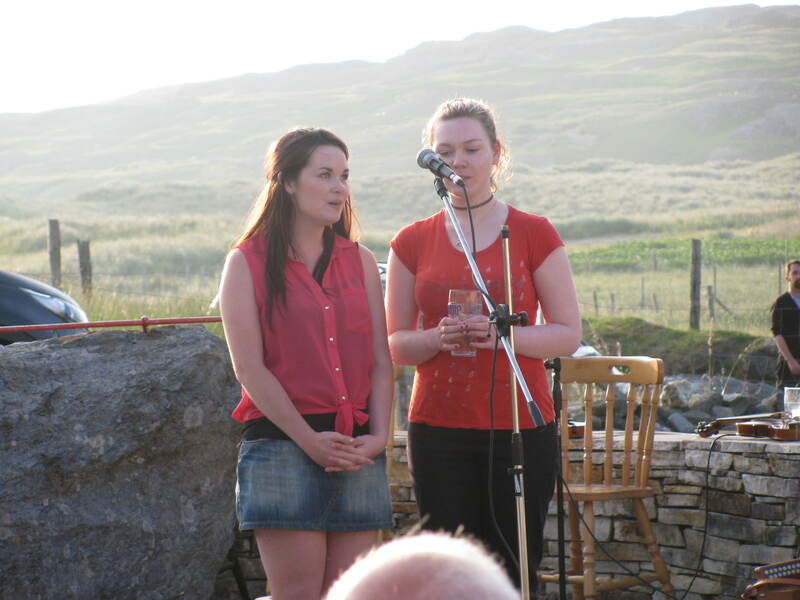 Catherine McGinley and Ellie McGinley performing at Oideas Gael’s Gathering. 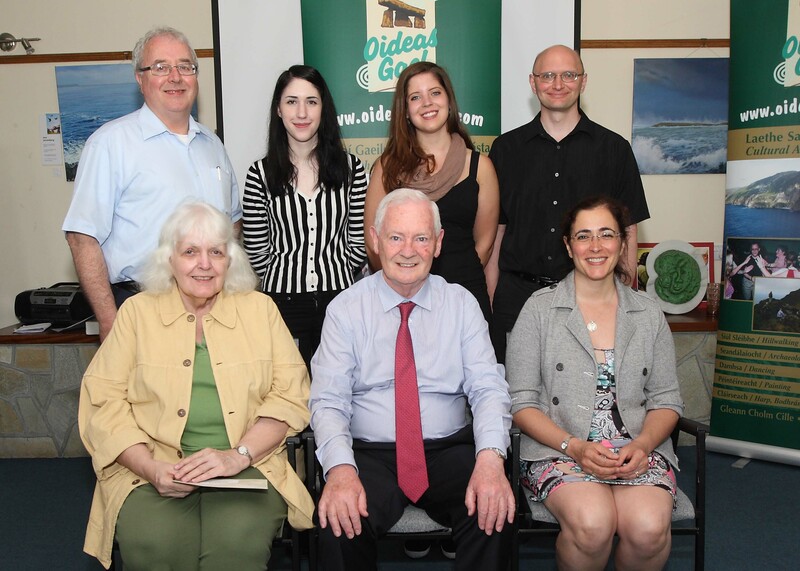 Minister of State at the Department of Arts, Heritage and the Gaeltacht, Dinny McGinley, was in Oideas Gael last week to congratulate some of those who received a Gaeltacht Summer Awards grant from the Fulbright Commission. These awards are grants from the Ireland-United States (Fulbright) Commission for Educational Exchange and offer U.S. citizens, currently studying Irish in the United States, funding to participate in Irish language courses in Ireland’s Gaeltachtaí during the summer. The awards are supported by the Department of Arts, Heritage, and the Gaeltacht and the National Lottery. Awardees have received a monetary award, which covers tuition and accommodation for the course of their choice in Ireland. Oideas Gael are delighted to have been chosen by nine of these award receipients for their summer study programme. You can view all the photographs on our Facebook page.